Black Friday is the biggest sales event of the year for bargain hunters. Here at Apache, we’re offering a 10% discount on all new Lyle and Scott gear as part of our Black Friday Menswear week — including four special early releases for SS18 season. 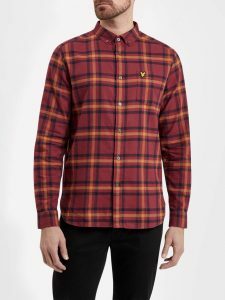 Just use the offer code BLACKFRI at online checkout to get 10% off all Lyle and Scott menswear at Apache! There’s no better opportunity to save money on a Christmas present. The core features of this early Spring Summer 2018 arrival are standard for Lyle and Scott sweatshirt — loopback cotton (with a hint stretch), ribbed cuff, hem and neck, and a classic neck embroidery. What makes it stand out is the stunning white-and-orange flecked pattern, unique to our entire menswear collection. Our favourite is the Leaf Green version (pictured), but you can also get it in Mid Grey Marl with white-and-black flecking. Here’s a classic all-purpose jacket with amazing functionality. Boasting a dual-layer of microfleece lining and wind/shower-proof shell, this stylish Parka will keep you warm and dry during the winter months. This SS18 early release is also light-weight enough to be worn in early spring on those fresh March/April mornings. There’s a superb selection of pockets — one zipped chest, two buttoned front, and one interior for extra security. 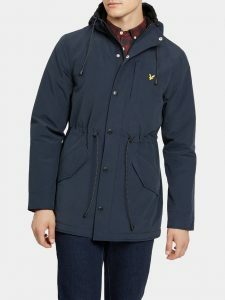 You can adjust the waist and neck with the elasticated drawstrings, and button up the front with Lyle and Scott branded poppers. Available in Dark Navy (pictured) and Leaf Green. The Autumn months always see a glut of check/flannel shirts from the top menswear brands. Lyle and Scott’s 2017 offering is pulled off in their trademark Scottish heritage style, and comes in Claret Jug (pictured) and Navy. Made with a soft brushed cotton, it boasts a comfortable handle that feels great against the skin, meaning you can wear it all day, every day, often with a white T Shirt underneath.. The woven check pattern has a “Lumberjack” vibe and is already getting high praise from our customers. Don’t forget our 10% discount on Black Friday menswear. 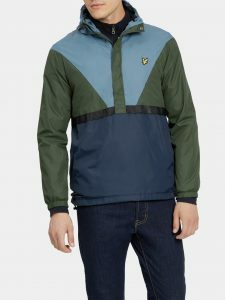 Lyle and Scott aren’t known for their sportswear heritage, but this new SS18 showerproof jacket holds its own against any of the traditionally “sporty” brands. It’s truly remarkable how warm these modern lightweight jackets are. We love the cut and sewn panel at the front, as well as the bold colour combinations, finished off with a vertical taped front. There’s a high-quality mesh lining for extra breathability, and an adjustable hood to keep out the elements. We’ve a similar jacket in Navy for those who prefer having front pocket. Here’s a little gem in our SS18 early release collection — a Seashell White T Shirt with an all-over “climbing wall” pattern. 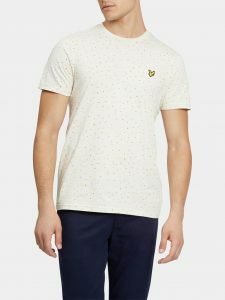 As you’d expect from Lyle and Scott, the 100% cotton fabric is amazingly comfortable and is ideal for layering under a shirt or jumper. If off-white isn’t your thing, then the Navy version is just as striking. A true highlight of our Black Friday Menswear week. 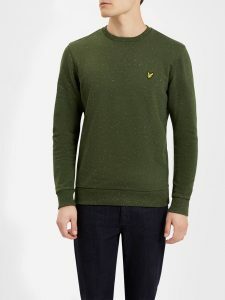 Every now and then, we get a new garment in that makes us go “wow!” This luxurious lambswool knit by Lyle and Scott is a classic knitwear style that manages to stand out from the crowd. Using prime Australian lambswool yarn and boasting a wonderful soft handle with remarkable warmth, it beats any man-made fabric hands down. Pick from a wide range of colours: Olive Marl, Charcoal Marl (pictured), Claret Marl and Navy. Buy here. 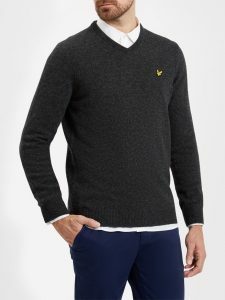 BLACKFRI is the discount code you need for 10% off all Lyle and Scott gear. Just use it at our online checkout and you’re good to go!